I’m excited to know what will come next, especially being aware (but not having seen) that something is forthcoming on turtles and I look forward to seeing what happens as other lepidos are investigated. I wonder if anyone has started to look for skeletal evidence of air sacs in mosasaurs? They were related, diverse, and probably very aerobically active. 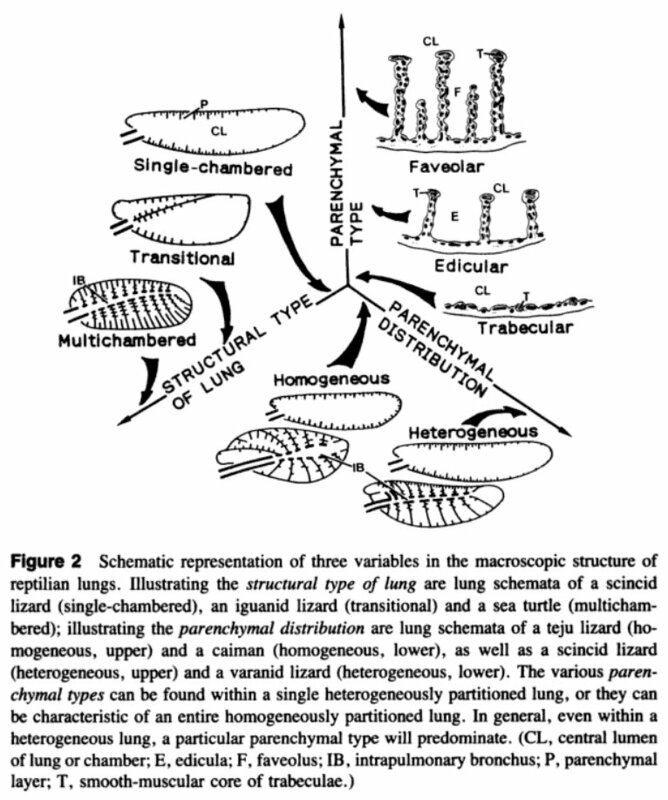 Saurischian respiration HAS been tied into survival through extinctions before, but in terms of the Triassic/Jurassic one (by Peter Ward), not the K/Pg. And yes: this came out of nowhere. Totally did not expect this! Nick, what do you know about that is going to be published on turtles? Pfft. Of course birds don’t sit atop the great chain of being. Sauropods do! On a more serious note, I’ve heard it suggested that the reason monitors are so weird compared to other lizards is because their method of gular pumping allows them to get around most of the issues of being an active animal and a sprawler. I’ve also seen mention of some monitor species being able to move using a semi-erect “high walk”. Any truth to this? Anon, I’ve heard the “gular pumping + costal ventilation = awesome” hypothesis too, and always thought it made sense. Now it turns out to actually be “gular pumping + costal ventilation + unidirectional airflow = even more awesome”. As for the high walk, I’ve seen monitors do something like that, but I’m not a locomotion guy so can’t comment usefully on the sprawling-to-upright continuum. In regards to the posting from Anonymous, gular pumping has been shown to aid in lung filling during locomotion in Varanus, Uromastyx, Eublepharis, Tupinambis and Heloderma (Owerkowicz et al. 1999). This has been interpreted as a means of getting around a physical problem known as Carrier’s constraint (Carrier 1987). 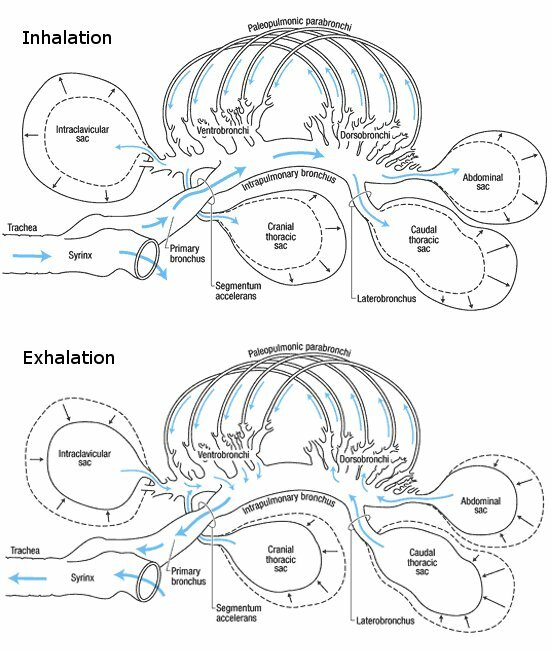 Though Carrier mentioned that sprawling may have an effect on breathing (through the use of respiratory muscles to help stiffen the thorax) the main crux of the argument was that lateral undulation was the main factor affecting breathing during locomotion. This tends to get missed in the later literature. Having an erect stance is going to do very little to effect locomotor stamina compared to just stiffening the thorax while moving. In regards to monitors doing this, Auffenberg (1981) observed that running Komodo dragons will hold their bodies and tails stiff, which should increase their ability to run aerobically (though at the cost of reduced stride length). Owerkowicz, T., Farmer, C.G., Hicks, J.W., Brainerd, E.L. 1999. Contribution of Gular Pumping to Lung Ventilation in Monitor Lizards. Science. 284:1661–1663. I agree with Duane; If varanids can develop unidirectional air flow in their lungs I would not be at all surprised if mosasaurs did too. If you can get more oxygen out of a lungful of air you can spend less time at the surface breathing where you are vulnerable to attack from below. And the rapid size increase and diversification of the mosasaurs suggests they were doing something(s) very right. Also on the topic of understudied modern animals, has anyone looked closely at how bats breathe especially when they are flying. There might be some interesting things going on that no-one has noticed. And comparing the breathing of pygmy monitors with komodo dragons and salvadori’s monitors would be a good way to look for the effects of size on their lungs; and looking at the lungs and breathing of perenties which have incredible stamina for a lizard would be a good idea too. As far as bats go, yeah, there has been a ton of work on their respiration. 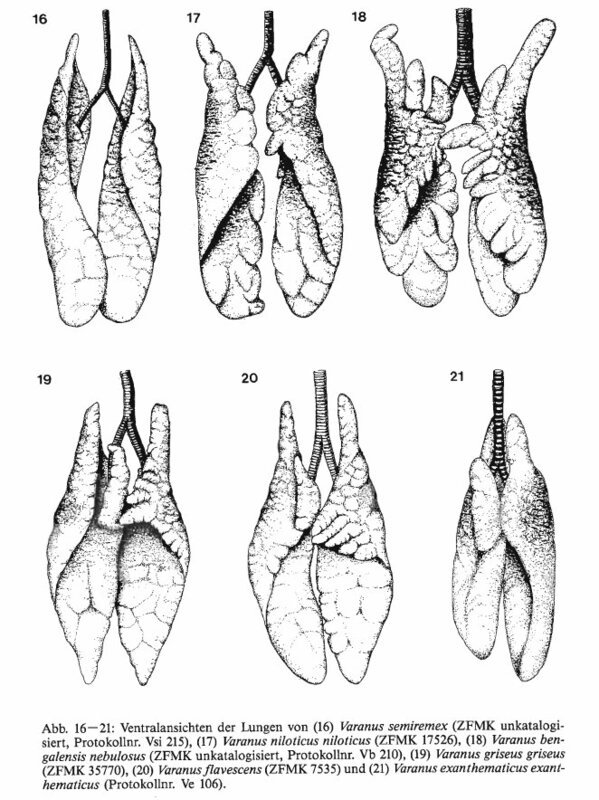 They breathe just like the rest of us mammals, and their alveolar lungs do not even allow the possibility of undirectional airflow since everything goes in and out by tidal flow through the entire bronchial tree. So unidirectional, air-sac-driven breathing may make flying easier, but it’s possible to be a successful powered flier without it. Are monitor lizards as a whole really that much more efficient? Just wow. Great summary Matt. I wondered about Mosasaurs too and have a couple of questions but will wait until the follow-up post about volant sauropods (or have I misinterpreted that?). Reading Clemente et al. paper on varanid endurance, we see quite a bit of variance regarding their performance and a lot of overlap with other squamates. 2. Varanids actually rock at endurance. See the max endurance graph in Figure 8, and note that it is on a log scale. The intercept for non-varanids looks to be 1.4, and the varanid intercept is about 1.7. Unpacked, those numbers are 28 and 50, which means that on average varanids have nearly twice the endurance of non-varanids! 3. Yeah, there’s variation, but. As Clemente et al. note in the abstract, and show in Figure 5, the species with the poorest endurance are all sit-and-wait predators–and as Figure 8 shows, the endurance of even those lowest-performing monitors is still at or above the best-fit line for non-varanids. So the answer to your question is, “Yes”. As a whole they tend to have twice the endurance of other lizards, and even the crappiest monitors are still as good or better than non-varanids. Now what we need someone to do is take the endurance data from Clemente et al. 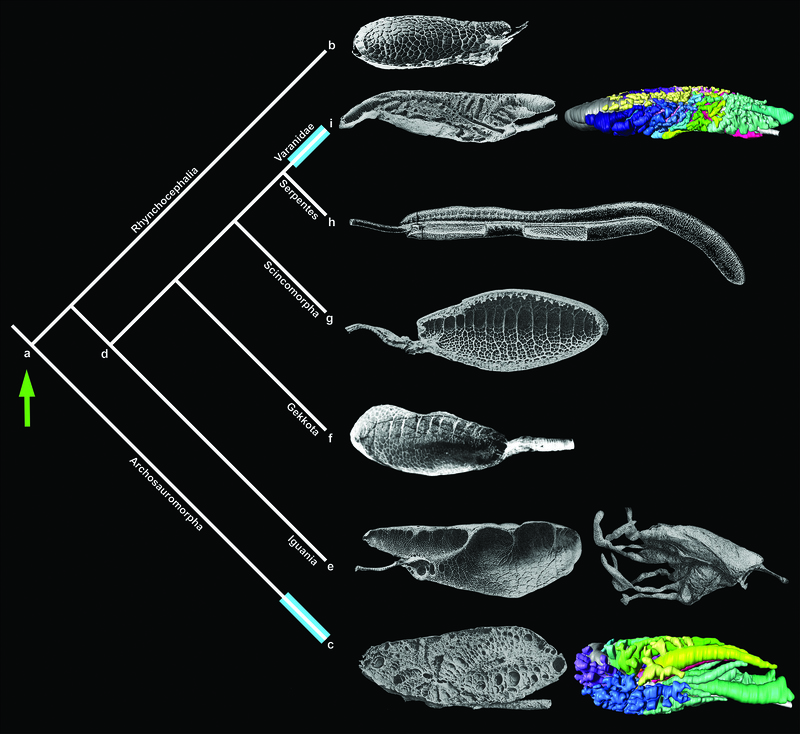 and the lung morphology data from Becker et al. (1989) and mash them up. The first step would be to see if endurance can be predicted by the gross morphology of the lungs. The next step would be to Schachnerize those monitors and see if airflow patterns varied, and if that variation was linked to gross morphology, endurance, or both. 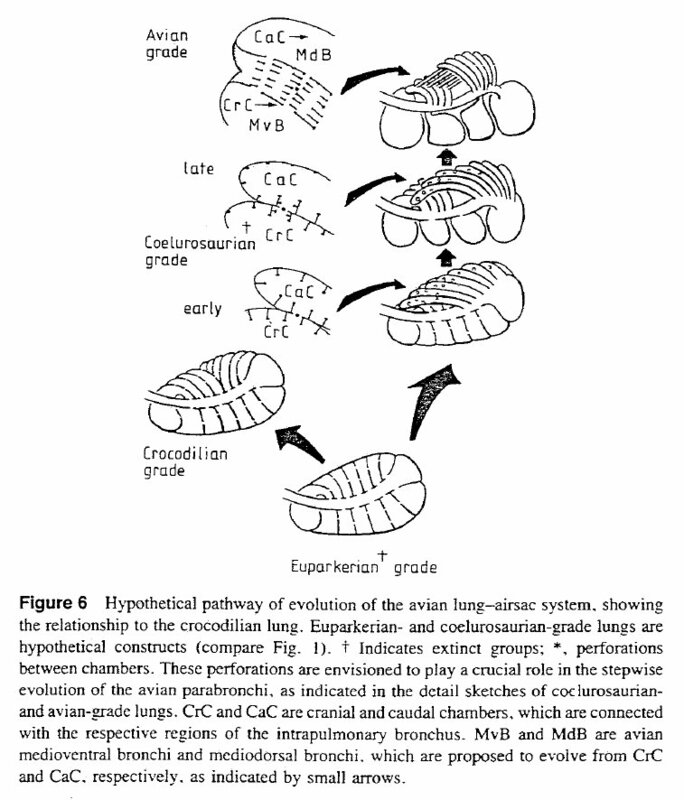 I notice with amusement that the linked page on bird respiration opens with yet another demo of why scalebars are best avoided. I assume the caption has the 1 cm and 2 cm measurements switched. … at least somewhat successful. Bats have never got big, like pterosaurs and (to a lesser extent) birds. I wonder whether respiratory inefficiency is part of the reason. 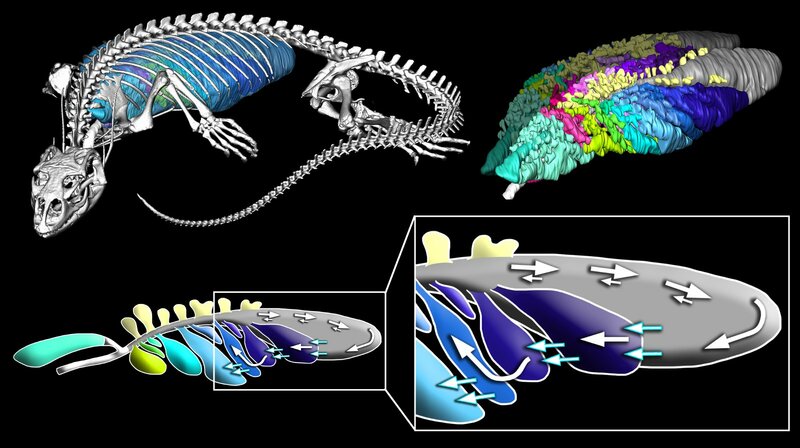 We mammals do seem to have got locked into some very inefficient local maxima; optimising the heck out of sac-shaped lungs looks like another one. crocs secondarily ecothermic – that’s an old old “news”! I was taught it in the late 90s, with lots of evidence behind it. Not only because I’m deep in love with all Toxicofera but also because I have a speculative dragon project where varanids are the closest relatives of the Draconiformes and I had a few problems with the design of the air sacs. … at least somewhat successful. Bats have never got big, like pterosaurs and (to a lesser extent) birds. Yeah, it’s an interesting problem. Mexican free-tailed bats have been tracked up to 11,000 feet when feeding on swarms of moths and on flights to hibernation caves, which can be cover hundreds of miles. But these feats fall far short of birds flying up to 30,000 feet and undertaking nonstop flights of thousands of miles. Plus, as you note, birds get a lot bigger and pterosaurs got bigger still. The question is, do bats underperform compared to birds because their respiratory system is less awesome, or because of ecological factors: hibernation caves are typically only a few hundred miles apart at most, bats larger than flying foxes might have a hard time finding things to hang from, etc. Or some combination of both? For max altitude anyway, the answer is almost certainly respiratory limitation, mammals just can’t hack it up that high. The reliance of most bats on hanging in repose could be seen as another local maximum, compared to the versatility of birds which only need an upward-facing surface to land on (and yeah, I know, small ones can land on vertical surfaces like tree trunks or even hang upside down themselves). Ken Dial gave a great talk at SVP this year on how birds actually get along with their wings and feet, and showed some photos of normally ground-living birds sitting on skinny branches with no problem, despite their lack of grasping toes. That does give me some pause, because it makes me wonder what bats are capable of that most of us just don’t know about. On the bird-bat front, there is a fabulously interesting paper by J.N. Maina from 2000 called, “What it takes to fly: the structural and functional respiratory refinements in birds and bats.” The section “Flight speed, endurance, and altitude” lists the records for both birds and bats, and that section is worth the price of admission all by itself. Or it would be, if admission had a price: the paper is freely available here. If bats are inferior fliers to birds, why haven’t night-flying birds (owls, frogmouths, potoos, nightjars…) outcompeted them to extinction? Two possibilities come to mind. One, bats are inferior to birds at the edges of performance–max altitude, max distance, etc.–but may be able to compete very well in the comparatively low altitude, low-endurance regime where they spend most of their time. Two, I don’t know all the details, but I’ll bet that bat sonar smokes the vision and hearing of night-flying birds in terms of fidelity and detail, which would give bats a big advantage in any head-to-head contests. Circumstantial evidence for this comes from the predation of birds by bats on the wing. I’ll bet that bat sonar smokes the vision and hearing of night-flying birds in terms of fidelity and detail, which would give bats a big advantage in any head-to-head contests. Reblogged this on Laissez Faire.